David M. Jablons, M.D., FACS, Professor and Chief of General Thoracic Surgery and Program Leader of the Thoracic Oncology Program, was recently inducted into into the American Surgical Society. The American Surgical Association was founded in 1880 and describes itself as the nation's oldest and most prestigious surgical organization. Among its members are the nation's most prominent surgeons from leading academic medical institutions, many of whom are Department of Surgery Chairs. Membership also includes leading surgeons from around the world. Edward Kim, M.D. and Pierre R. Theodore, M.D. will be among the recipients of 2011 Haile T. Debas Academy of Medical Educator's Excellence in Teaching Awards at the Academy's annual Celebration on Monday, September 19, 2011. The Haile T. Debas Academy of Medical Educators is dedicated to creating an environment that enhances the status of teachers at UCSF, promotes and rewards teaching excellence, fosters curricular innovation and encourages scholarship in medical education. The UCSF Thoracic Oncology Laboratory, led by David Jablons, M.D., Professor and Chief of Thoracic Surgery and Program Leader of Thoracic Oncology, recently launched its first Lung Cancer Joint Laboratory in China, an alliance with Guangzhou Institute of Respiratory Disease (China National Key Laboratory of Respiratory Disease) and the First Affiliated Hospital of Guangzhou Medical College. 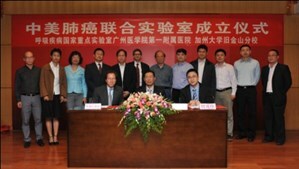 A signing ceremony was held in Guangzhou, China. Thierry Jahan, M.D., an Associate Professor of Medicine Bonnie J. and Anthony Addario Endowed Chair in Thoracic Oncology, is one of four recipients of the 2010 UCSF Medical Center Exceptional Physician Award, an honor recognizing dedication to outstanding patient care and to the instiutions' values of Professionalism, Respect, Integrity, Diversity and Excellence. One of the region's most highly regarded thoracic oncologists and sarcoma specialists. Last October, opera singer Zheng Cao fell during a performance and had no idea why. Later, it turned out she had advanced lung cancer. Now, as a result of treatment with a new type of targeted therapy, her cancer is retreating. Personalized medicine - that is, customizing the treatment to the patient's tumor -is rapidly gaining ground in the treatment of lung cancer.This has given hope to patients like Zheng Cao that their lung cancer can be successfully treated. Dr. David Jablons, Chief of the Thoracic Section, is co-chairing the 13th World Conference on Lung Cancer, July 31 - August 4, 2009. The meeting will be held at the Moscone West in San Francisco. Dr. Jasleen Kukreja "is not the first surgeon to perform a minimally invasive lobectomy at UCSF, but she may be a pioneer in the two-finger clamp technique, because her predecessors are men who have a tougher time squeezing in both fingers. Last summer, she became the first doctor to be hired by UCSF to focus primarily on this discipline." Before an overflow crowd at the UCSF Comprehensive Cancer Center, members of the Thoracic Oncology Program speak about the challenges of lung cancer and the progress that has been made in finding effective treatments and one day a cure. 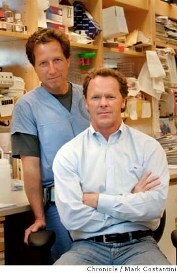 Adding their own contributions to a rapidly advancing field, UCSF researchers - along with colleagues from Incyte Corporation and the University of Texas Southwestern Medical Center - have described new targets in lung cancer and evaluated a promising new drug candidate that halts growth signals in tumor cells grown in the lab. Their report is featured in the July issue of the scientific journal Cancer Cell. "We will discuss the most sophisticated approaches to lung cancer in the world," said David Jablons, MD, UCSF associate professor of surgery and program leader of the UCSF Thoracic Oncology Program. "Both the scope of the problem and the barriers to care in China are dramatic, but we hope this conference can help rally the international scientific community to address the crisis." 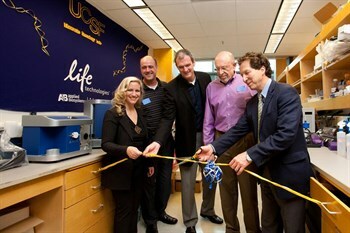 Jablons, who conducts translational research into targeted cancer therapies, is director of the UCSF Thoracic Oncology Laboratory."